Direct people out of the attack stair and out of harm’s way. Perform reconnaissance for the command post; to become the “eyes and ears” of the incident commander. Take carbon monoxide (CO) readings at various intervals to determine where major pockets exist. Now that we have clearly defined the above three important functions, let’s expand the role of the Rapid Ascent Teams. How can we ensure the evacuees can get out of the attack stair? What if the stair doors are mechanically locked or only unlock — or stay unlocked — on certain floor intervals? On too many fires, the civilians are on their own for the most part and are not tended to unless they specifically call for help via cell phone or fire phone when they become trapped in the attack stair (or other stair that might also become contaminated). In most modern commercial buildings, the stair doors unlock at alarm or there are re-entry/crossover floors that unlock or stay unlocked every three to five floors on average (tower stairs in hotels and residential buildings tend to stay unlocked). Even re-entry/crossover floors have drawbacks though. For instance, what happens if they are more than three floors apart and the fire happens to be on a re-entry floor level? (see graphic 3) This means people with physical liabilities such as heart conditions or obesity would then be forced to travel back up to the next re-entry floor to leave the attack stair. In proximity to the fire floor, they are not likely to be able to make their way past hordes of firefighters and hose (attack and back-up lines) being snaked everywhere. Climbing back up even three, four or five floors could prove to be too much of a burden for them to bear, especially if they have just descended numerous flights of stairs and smoke is now entering the shaft. Even auto-release devices on door locks can fail during fires, as it has been estimated that they average a 10-15% failure rate due to improper installation, incorrect hardware or lack of testing and maintenance. None of these “escape methods” are foolproof. People must be accounted for and looked after. Do we want our Rapid Ascent Teams forcing doors to provide a way out for people in the attack stair at various levels above the fire? (As noted in part one, the exception would be if it were a hot-weather fire and where a significant “reverse stack effect,” or downdraft, is taking place whereby air and smoke are being pulled downward via shaft ways. This movement of air within a high-rise will be further explained in an upcoming article dedicated to “Air Balancing”.) Their energy must be conserved for the climb they must perform. It is imperative that this concern be an integral part of the overall scope of any high-rise incident command system. 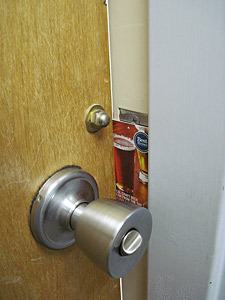 In older commercial buildings, the doors may be mechanically locked with no drop-out on alarm, releasing the door locks to the unlocked position. With either mechanically locked doors or re-entry floor applications, eventually all locked doors must be unlocked for the search teams that may be assigned to search floors above the fire in a serious event. There will only be a few stair keys available to fire crews in the lobby on arrival, so they must be used with great wisdom. Sometimes there are none. This greatly complicates the issues noted here, as at least six stair keys must be available to first responders in every high-rise building. Why? In many fires, the keys disappear with the first-due attack and search teams heading upstairs, never to be seen again for the remainder of the fire. Forcing doors on numerous floors above the fire is not a realistic option for search teams or Rapid Ascent Teams. Early into the fire, primary Rapid Ascent Teams must quickly follow these units to regain control over these keys, if there are no extras in the lobby. It must be agreed upon that the keys will be placed at a common location — left in the locks at the fire floor (and floor above) by both search and attack teams — even if the doors were found unlocked. They would then be retrieved by the Rapid Ascent Teams, who begin ascending the attack stair to perform their assignment. Now, the teams can perform one additional task: as they stop every five floors for a breather and to take a carbon monoxide (CO) reading, they verify that landing’s door is unlocked. If it is not, they use their key to unlock the door and place a blocking device across the keeper, then close the door again to maintain the shaft way’s integrity as much as possible. A solution might be a card key with a strong adhesive easy-peel strip-off backing placed across the keeper, other than using duct tape or rubber straps. These cards can be carried in bulk quantity in a small satchel. They then move on to the next five-floor interval and repeat the process. If a team member carries a marker, the door could even be marked “UNLOCKED” at these levels. This would not be relevant with designated re-entry floors that many buildings have. What about fire departments that can only afford the assignment of two or three Rapid Ascent Teams during the initial stages of a serious fire? How can they manage the strain of continuously moving up and down the attack stairs throughout the fire, trying to re-direct a fragmented population of evacuees above the fire floor? In the very near future, one answer might be the placement of red flashing lights inside the stairs at each landing level — or at least every five-floor intervals noted above — by Rapid Ascent Teams. These small, lightweight devices can also be carried in satchels. Tenants would be educated through the fire prevention bureau and building management team (as they have over time with the flashing red alarm strobes out on each floor) about what the lights in the stairwell represent. Even without firefighters present, they would realize as they entered (or descended) the attack stair if they are in danger. The lights can be used in conjunction with public address system announcements that may or may not be heard inside noisy stairwells. Red and green lights may one day be hard-wired into all new high-rise building stairwells as a code requirement. At the lobby fire command center, switches on a panel could activate these lights to go red or green on any given stair landing. Once a red light switch is activated, all floors above that landing would go into red blinking mode and others below that floor could be activated manually for warm-weather fires. 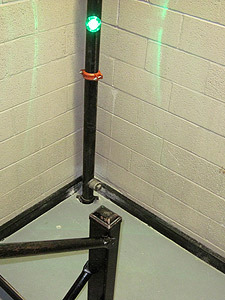 The designated evacuation stairwell lights could also then be put into steady-green illumination mode. The lights would be complimented by signs mounted on stair doors indicating their presence and use; i.e., “Flashing red lights = Do not use stair for evacuation – Steady green lights = Safe to use stair”. Two recently built high-rises in one Canadian city implemented this concept into their construction plans. This may become standard fare in future high-rise construction. In conclusion, we must collectively approach the recurring issue of losing civilians in the attack stair due to an inability to quickly address this concern in a tactically effective manner early in a fire. We cannot continue to repeat history. This article hopefully will serve as a basis of dialogue to get firefighters throughout the world to come up with ideas that can further enhance the Rapid Ascent Team concept or even replace it with a better initiative. As a fire service, we can never remain static. We must maintain a progressive-minded approach to the job at hand and be smarter with our resources. Severe budget constraints have resulted in reduced manning and rolling brownouts (or complete shut-downs) of some firehouses. At first glance, the Rapid Ascent Team concept involves the acquisition and application of personnel (and some equipment) to assignments that seem to only further strain existing duty demands that have to be met on all high-rise fires. 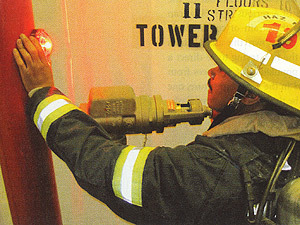 However, it must be realized that if the stairwells are not addressed early into the incident (i.e., guiding occupants out of the attack stair, monitoring CO levels, ensuring stair doors are not locked and gathering intelligence on upper floor conditions for the command post), then the incident commander will be forced to not only play catch-up when things begin to unravel in this part of the fire arena, but the results will impose an even greater demand on personnel and resources attempting to contain a quickly deteriorating situation. This concept will actually reduce the manpower commitment on these fires, as fewer fire crews must be committed to floor levels well removed from the fire. The concept allows the highest chance of success in effectively managing even the most severe fires in high-rise buildings by focusing on the often-overlooked areas where significant loss of life can likely occur.